Eva Moreda Rodríguez on the formative years of the recording industry, focusing on the culture surrounding the gabinetes fonográficos of fin-de-siècle Spain. Coloured engraving after J.T. Balcomb depicting an Edison phonograph with a carbon microphone, 1878 — Source: Wellcome Library. To the question “When were recordings invented?”, we might be tempted to answer “1877” — the year when Thomas A. Edison was first able to record and playback sound with a phonograph. But what if we think of recordings not as mere carriers of sound, but as commodities that can be bought and sold, as artefacts capable of capturing and embodying values and emotions; of defining a generation, a country or a social class? The story then becomes one that unfolds over three decades and is full of many layers and ramifications. Without Edison’s technological innovations, recordings would have certainly never existed — but hammering out the concept of recording were also a myriad of other inventors, musicians, producers, and entrepreneurs from all over the world. Most of them were enthusiastic about being part of a global revolution, but they worked in close connection with their milieu too, shaping recording technologies and their uses to relate to the needs, dreams, and desires of the audiences they knew. The tenor Florencio Constantino was one of these now-forgotten pioneering individuals. Born in 1868 in Ortuella, a mining village miles from the Bilbao estuary in the Basque Country, Constantino was one of the first musicians in history to develop a recording career worth the name. In fact, his life and career interlock with the early history of recorded music in fascinating ways. He was part of a generation of Spaniards who discovered recorded sound in their teenage and early adult years, found himself in high demand as a recording artist in local studios in Spain at the end of the nineteenth century, and went on to record internationally as multinationals decimated Spain’s indigenous industry. 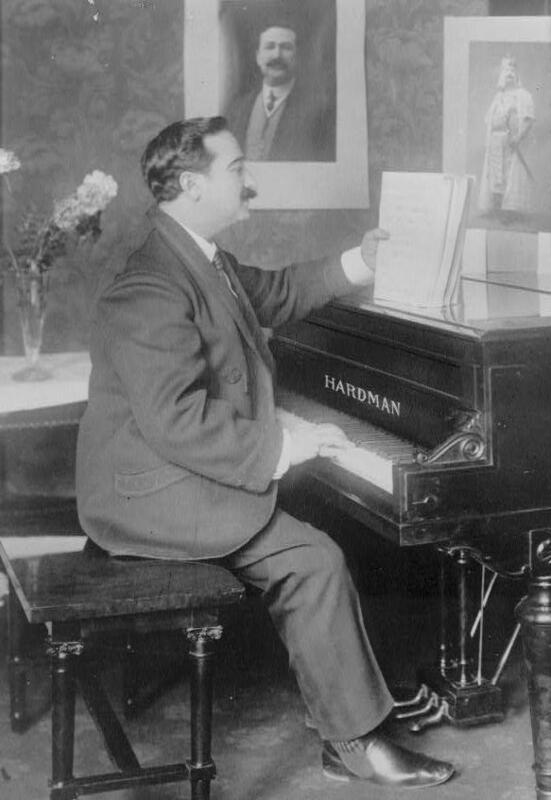 Florencio Constantino at a piano, ca. Edison initially believed that the phonograph would be most in demand in offices and companies: recorded sound, he thought, would make business communication easier by doing away with the ambiguities of written language. 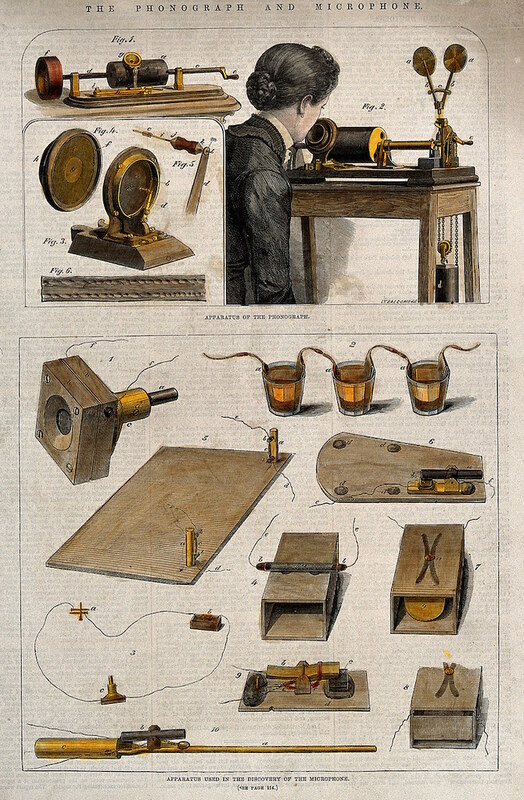 However, the Improved Phonograph and Perfected Phonograph, both of which he launched in 1888, took recording technologies in a different direction. 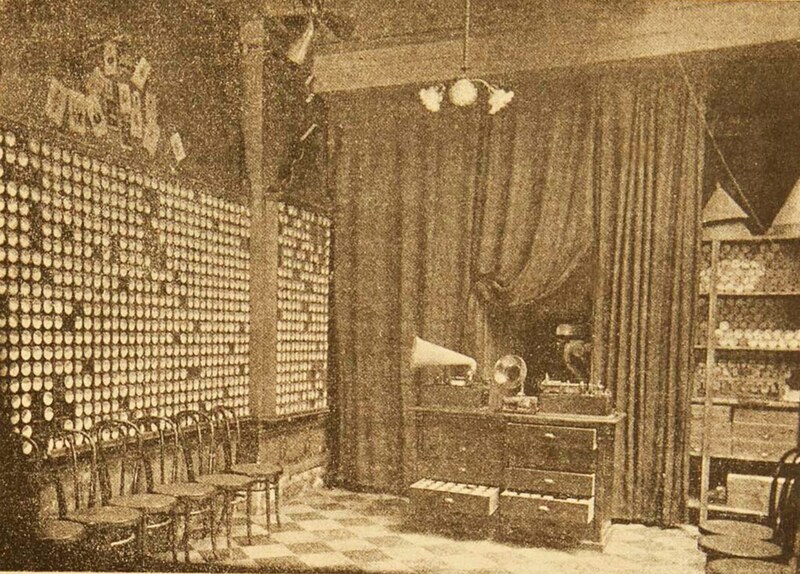 Audiences turned out not to be interested in the phonograph because of its practical uses, but because it entertained them: the first phonograph parlor opened in San Francisco in 1889, and was soon followed by thousands others all over the United States. In Constantino’s native Spain — more rural, less industrialised — phonographs were instead paraded around cities and towns and temporarily installed in civic centres, schools, hotels, and churches. For a modest fee, locals from all social classes were able to acquaint themselves with the latest discoveries of science. Some of the names and endeavours of these Spanish phonography pioneers have found their way to us today through advertisements and reports in local newspapers. Many of them were agents of Edison’s or funfair impresarios, and we know of a cornet player and entertainer by the name of Lorenzo Colís who in the summer of 1894 toured a phonograph around the Basque Country and La Rioja, and visited the Ortuella area. 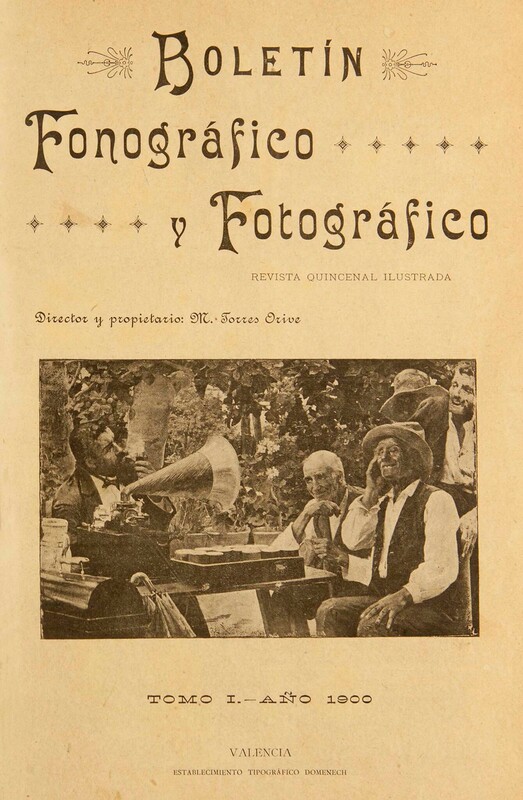 Front cover of the inaugural issue of Boletín fonográfico (1900), featuring an image of people listening to a touring phonograph — Source. And yet, if we were to listen to some of the surviving examples from this era, we would probably find it hard to believe that anyone could have mistaken what is in them with live sound, even accounting for deterioration of the cylinder. While it is true that some such claims simply echoed Edison’s publicity (or transcribed it to the letter), one can imagine that an unfamiliar audience, shocked by the experience of hearing recorded sound for the first time, would be willing to forgive shrillness, blurriness, and lack of definition, and accept what they heard as an accurate representation of reality. Moreover, most audiences would not be particularly interested in hearing a particular recording again and again after they had established that it was, indeed, true to reality. In any case, most would not have been able to do so unless a phonograph was in residence in their town: phonographs were expensive and difficult to manipulate at the time, hardly appropriate as a home appliance. Although some recordings from that era have survived to the present day, most were intended to be as ephemeral as the sound they recorded: played back in phonographic sessions but seldom treasured in households or collections. The phonograph became a domestic appliance with the successive launches of the Spring Motor Phonograph, the Edison Home Phonograph, and the Edison Standard Phonograph between 1896 and 1898. With this came the need for a constant supply of professionally produced, well-crafted recordings that could lure upper- and middle-class phonograph owners back to the shops again and again. The recording as a commodity was born — but it still had to be embedded with values and meanings potential buyers could relate to; values and meanings that resonated with ideas they might have had about themselves, but also connected them to the powerful narrative of the global revolution brought over by recording technologies. In Constantino’s native Spain, the task was undertaken by some forty gabinetes fonográficos (phonography studios) scattered across the country — a Spanish phenomenon in some respects, relatively independent of Edison’s commercial enterprises in more industrially developed countries. The gabinetes sold phonographs imported from the United States, but the wax cylinders were recorded and produced by the gabinetes themselves. The front of gabinete Pallás of Valencia, featured in Boletín fonográfico, no.18, 1900 — Source. The interior of gabinete Pallás of Valencia, featured in Boletín fonográfico, no.18, 1900 — Source. The gabinetes not only produced the first recordings to be made in Spain, they also produced the first Spanish recordings — that is, recordings shaped by the culture they were part of. This is immediately obvious in the choice of repertoire. Theatrical culture thrived in turn-of-the-century Spanish cities: the upper and established middle classes flocked to opera houses; the working and lower middle classes, to zarzuela theatres and café cantantes where flamenco was performed — although the latter two still managed to attract a few members of the wealthier social classes who longed for authenticity. 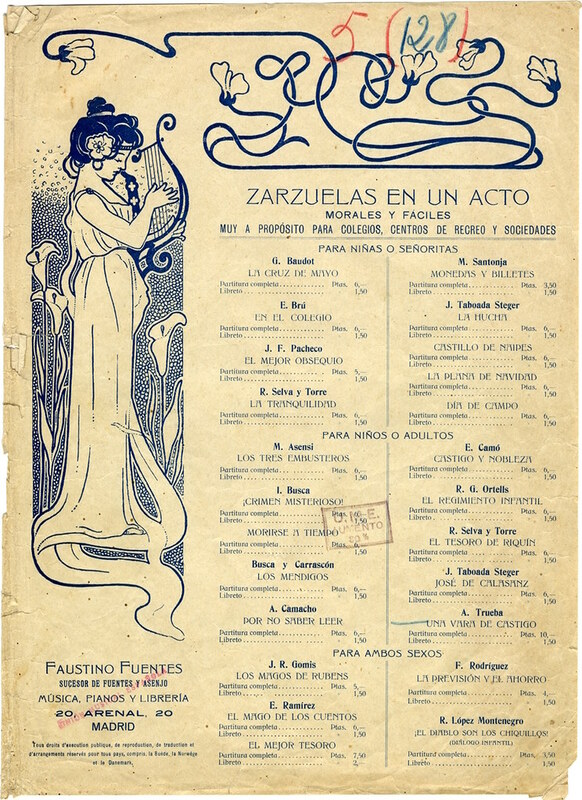 Soon, opera, zarzuela, and flamenco were filling the gabinetes’ catalogues. Not all cylinders were equal though: recording opera for Hugens y Acosta, Constantino was one of the few singers able to command 30 pesetas per aria in 1899, shortly after returning to Spain from Latin America to debut at the Teatro Real. A well-established zarzuela soprano would normally command between 10 and 15 pesetas, while flamenco recordings could be bought for as little as 3 pesetas. A glimpse at Madrid’s urban geography also suggests that the nascent recording industry and theatrical culture interlocked in more profound ways. Several gabinetes opened in the surroundings of opera and zarzuela theatres. One of them, Viuda de Aramburo, was a mere few yards from the Teatro de la Comedia; it originally sold scientific and technical equipment and started marketing its own wax cylinders in 1898. We know from El cardo, a phonography magazine published in Madrid between 1899 and 1900, that Viuda de Aramburo employed a rather astute apprentice, and so it is not out of the realm of possibility that the young man, having observed theatre-goers walk past his shop, figured out that they might welcome the opportunity to buy recordings of their favorite zarzuela arias as a sonic memento of what, by all accounts, was a lively and highly entertaining experience encompassing music, acting, and dancing. 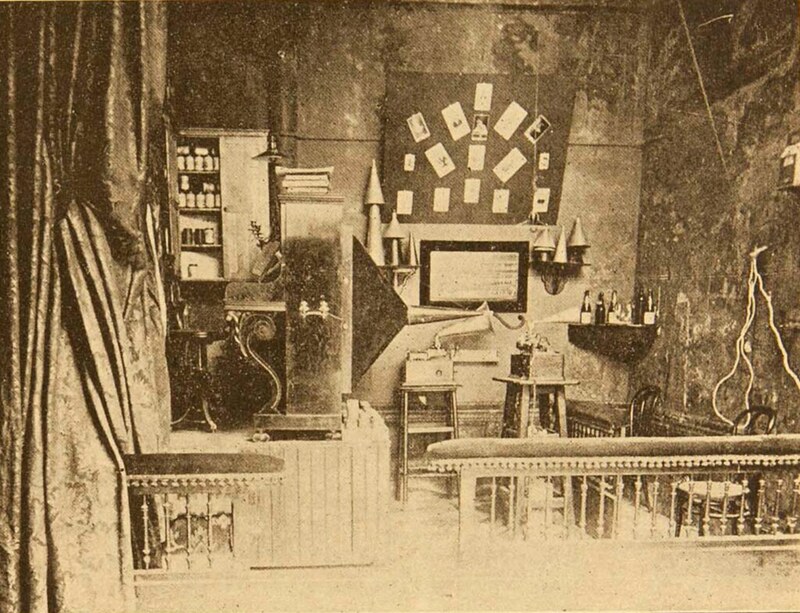 Álvaro Ureña — a soldier who left the army to dedicate himself to science and technology — might have followed a similar reasoning when he opened his luxurious gabinete fonográfico in 1897 in the prestigious Barquillo street in the centre of Madrid, not far away from the Teatro de la Alhambra. Ureña’s and other gabinetes were luxurious indeed; their recordings were only affordable to the upper and middle classes. Gabinete owners, however, made sure to emphasise, sometimes in the same breath, that they were as committed to disseminating the latest discoveries of science and technology as they were to providing a sumptuous experience to their customers. Of Ureña’s gabinete, the newspaper La correspondencia militar wrote that: “There cannot be more luxury, art and wealth in this establishment. Large rooms, and elegant electric lamps hanging from the ceiling; the golden and bronze-coloured filigree interlocks artistically and contrasts with the power of the very modern voltaic arcs; phonographs of all sorts are laid out very tastefully around the place.” In turn-of-the-century Spain, buying a wax cylinder meant identifying as a member of an emerging middle class who was no longer interested in indulging in luxury for luxury’s sake, but was committed to the country’s economic and social advancement through the dissemination of science and technology. Many owners of gabinetes were themselves part of this emerging middle class, such as electrician Julián Solá in Madrid, and opticians José Corrons in Barcelona, Obdulio Bravo-Villasante in Madrid, and Pablo Lacaze in Zaragoza. In the era of the gabinetes, though, wax cylinders still differed from modern recordings in one crucial aspect: they could not be duplicated in a reliable and effective way. Most surviving recordings from that time are one-offs. If a gabinete was faced with an unprecedented demand for, say, recordings of “La donna è mobile” by Constantino, the only way to satisfy customers would be to hire Constantino to record several takes of the aria, all different from each other. It was unrealistic for the Spanish industry to rely on a few outstanding or well-known performers to meet the demand, and so, alongside with Constantino, a multiplicity of lesser known, jobbing singers ventured into the recording industry with a modicum of success. Some singers of the era, in fact, are only known to us in connection with the recording industry. Their names are Amparo Cardenal, Luisa Alarcón, and Francisco Cervera; there is no evidence that they ever graced a professional stage, and they might have even been talented amateurs who found an opportunity of making money out of their singing thanks to the gabinetes. The gabinetes, on the other hand, turned technological limitation into a virtue and some of their owners routinely proclaimed that they were artisans rather than mass producers, carefully crafting each cylinder and making Spanish recordings superior to those coming from any other country in the world. 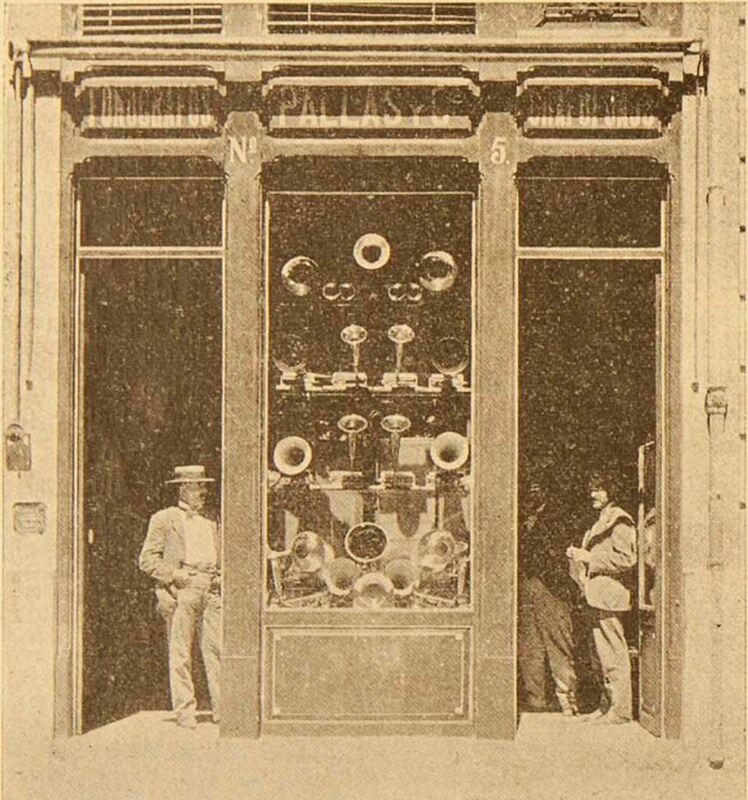 The gabinetes’ enthusiasm and commitment, though, did not help them survive when the gramophone, which recorded on reproducible discs, took hold in Spain after Compagnie Française du Gramophone opened a Spanish branch in 1903. They resisted for a couple of years, but by 1905 many had closed down and the rest were operating as subsidiaries of the Compagnie or other multinationals such as Pathé and Odéon. Constantino, who had by then embarked on an international career in Eastern Europe and America, recorded zarzuela arias for the Barcelona branch of Pathé in 1903, followed by G&T in Berlin, Edison Records in Italy, Pathé and Odéon in Paris, and Victor and Columbia in the United States. Many of his colleagues who had thrived during the era of the gabinetes found themselves unable to compete against better or more established singers and went back to the stage. Constantino died in poverty in Mexico City in 1919 after a series of artistic fiascos. Seven years later, the invention of electrical recording revolutionised the industry again; one of the many technological advances in the capturing of sound that would occur throughout the twentieth century and on into the present. Despite these changes, the recording itself has — with its ability to travel the world, shape culture, and connect the listener to a community of performers and other listeners — still kept to this day most of the defining traits it acquired thanks to Constantino and his contemporaries. Eva Moreda Rodríguez is a cultural historian of Spanish music, with research interests spanning from the late 19th century to the present. She is currently a lecturer in Music at the University of Glasgow and the author of Music and Exile in Francoist Spain (Ashgate, 2015) and Music Criticism and Music Critics in Early Francoist Spain (Oxford University Press, 2016). She is also an award-winning novelist in Galician, and her English-language fiction (as Eva Ferry) has been published in journals and anthologies. Various issues of Boletín fonográfico (1900–1). In this award-winning text, Mark Katz provides a wide-ranging, deeply informative, consistently entertaining history of recording’s profound impact on the musical life of the past century, from Edison to the Internet. In this original, provocative book, Arved Ashby argues that recording technology has transformed our understanding of art music. Contesting the laments of nostalgic critics, he sees recordings as socially progressive and instruments of a musical vernacular, but also finds that recording and absolute music actually involve similar notions of removing sound from context. The first general book on the history of the recording industry, covering the entire field from Edison’s talking tin foil of 1877 to the age of the compact disc. Chanan considers the record as a radically new type of commodity which turned the intangible performance of music into a saleable object, and describes the upset which this caused in musical culture.